Riversand is hosting a webinar highlighting how digital transformation is shaping MDM and how businesses are rethinking their MDM strategies for competitive advantage. 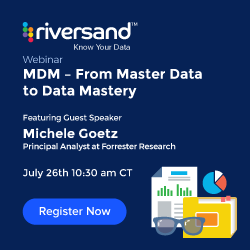 Riversand Technologies, a Master Data Management visionary and a Product Information Management Leader, presents a webinar featuring Forrester Research on July 26, 2017, at 10:30 am CST (11:30 am EST, 9:00 am PST). To achieve digital transformation means businesses need to be data-driven, insight-rich, and intelligently powered. Companies that strategically invested in MDM consistently outperform both digital and non-digitally focused organizations. MDM brings understanding to the data across a complex hybrid ecosystem of data silos and platforms allowing digital enterprises to gather, orchestrate and syndicate data and insights anywhere at any time. The best practices, skills, and technologies needed to power master data are the foundational skills to scale the broader investment in information and analytic architecture. How MDM is at the center of driving stronger business outcomes. How MDM competencies lay the foundation for data mastery and deeper insight. Evolution of MDM technology to meet new challenges. Register now to attend this free Webinar.